My mother, in an attempt to break her ridiculously expensive habit of stopping off daily at the local coffee shop for a latte and a bran muffin, came up with a truly terrific bran muffin recipe. The batter can last in the fridge for up to a week, so you can make yourself warm, crusty and delicious bran muffins every day if you like. 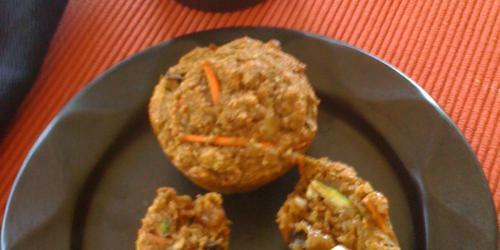 These muffins are chock full of vegetables, fruit, and nuts in addition to the healthy bran fiber, so you can feel really good about your breakfast. 1 cup buttermilk $1.50 for 1 qt. 1.5 tsp cinnamon $1.50 for 1 oz. Preheat oven to 350 degrees F. Beat together fruit puree/applesauce, egg, sugar and buttermilk. Stir in bran. Sift together flour, baking soda, baking powder, spices and salt. Fold flour mixture into liquid mixture, until just blended. Fold in shredded veggies, nuts and raisins and spoon batter into prepared muffin tins—I like to use mini-muffin pans and I spray with Pam. Bake for 15 to 20 minutes, or until a toothpick inserted into the center of a muffin comes out clean. Makes 12 regular muffins or 24 mini-muffins. I offer this alternative that has been in my family for years. Prices based my local stores, you mileage may vary. Six-week Bran Muffins…supposedly they can last in the refrigerator for six weeks, but in our house they never stay around that long. They can survive a trip through the freezer also. 4 beaten eggs | $1.75 doz. Mix cereal, sugar, flour, baking soda and salt in a large bowl (very large bowl). In a separate bowl, mix eggs, shortening, and buttermilk. Add wet to dry ingredients and mix well. Use muffin papers or grease muffin tin. Fill 2/3 full and bake for 15-20 min. These are super hearty and really scrumptious! There is a lot of flavor going on when you take a bite into this muffin, although they are subtle flavors. My palate was lovin me! The muffin is definetly filling and was MUCH better than any type of bran muffin you can buy at a coffee shop or bakery. I took the advice and saved half the batter to cook the rest of the muffins later on so they would be warm..They taste good with butter and a cup of hot tea or coffee…Enjoy! Recipe looks great! Want to mention though, raw egg in a batter that sits in the fridge for more than 24 hours can be dangerous and 6 days is unthinkable! Great substitutes that can safely withstand hanging out in their uncooked state are: bananas, silken tofu, applesauce, and flax meal. There’s only one egg in this, so maybe just leave it out and add a bit more water and some more baking powder? Best wishes to all! I offer this alternative that has been in my family for years.